A representative panel organized by the World Agroforestry Centre (ICRAF) at the Global Landscapes Forum: Peatlands Matter, a CGIAR Research Program on Forests, Trees and Agroforestry (FTA)-related event held on May 18, 2017, in Jakarta, Indonesia, discussed the challenges and successes of improving the management of peatland in the country. 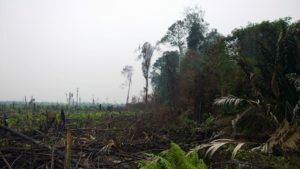 Indonesia has suffered massive economic, environmental and health losses owing to fires that annually ravage peatland and from general poor management of the unique landscapes. By way of background, Slamet Supriyadi, a farmer from Jambi province, provided firsthand testimony about how he had cleared peat forest and then planted oil palm, jelutung (Dyera polyphylla, a once-widespread, indigenous tree that produces a latex that was formerly the main ingredient in chewing gum), coconut and coffee. “We were eventually reprimanded by the government,” he said, “because the land status was ‘protection forest’. We were in conflict with the local forestry office, which intimidated us but through negotiations facilitated by ICRAF we were able to understand each other. We stopped trying to blame each other. 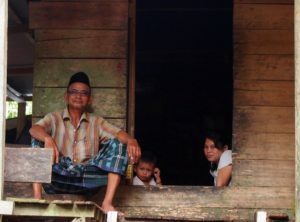 “We understood we were wrong and yet the government wouldn’t evict us because we had explained to them that our livelihoods depended on the peatland. So the government came up with a solution: they told us they needed to preserve the land and that we had to comply with the regulations, such as planting certain kinds of trees like mango (Mangifera indica), durian (Durio zibethinus), jelutung and nutmeg (Myristica fragrans). FTA scientist Atiek Widayati, leader of the Securing Ecosystems and Carbon Benefits by Unlocking Reversal of Emissions Drivers in Landscapes project (2013–2015) that was funded by the Norwegian Agency for Development Cooperation, confirmed the testimony of Supriyadi from the project’s own participatory research, part of which included the facilitation of the negotiations mentioned. The overall aim of the project in Indonesia was to assist the Tanjung Jabung Barat district government and farmers to find land-use options that would reduce greenhouse-gas emissions and also improve their livelihoods. The situation described by Supriyadi was a common one, Widayati said, with its roots as far back as the 1970s and the beginnings of Indonesia’s transmigration schemes that shifted people from densely-populated islands to work on plantations and open new land for smallholding agriculture. “The communities saw the land as wasteland that they could use as they liked,” she explained. ‘They occupied the fringes of peat forests, dug drainage ditches and grew cash crops like coconut to make a living. This shows that agriculture on peatland can transform livelihoods positively. The challenge comes with disasters like the fires and the over-use of peatland. Hesti Tata Lestari, a researcher at the Forestry Research, Development and Innovation Agency of the Ministry of Environment and Forestry, had researched peatland rehabilitation using jelutung, which is one of the tree species that has specialized roots that allow growth in areas with a high watertable. “Communities in Sumatra had already planted jelutung with other forest-tree types,” she explained. “This had also been happening in Central Kalimantan. 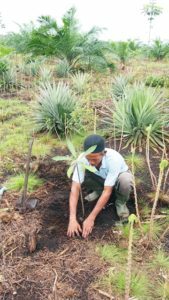 The problem at the moment is that there is a limited market for jelutung latex so it is important to rebuild it to motivate farmers to plant more of the species. They also need support in how to manage the tree and process the latex. This knowledge was lost from the last generation. The moderator of the discussion, FTA scientist Ingrid Öborn, ICRAF’s regional coordinator for Southeast Asia, noted that these examples showed that farmers and governments can collaborate and create a synergy in which people work in their own interest yet produce mutual benefits. There was, moreover, a large potential to magnify this kind of cooperation by taking advantage of the extensive canal systems that were originally designed to drain the peat (and which led to it being more prone to burning) and other waterbodies. 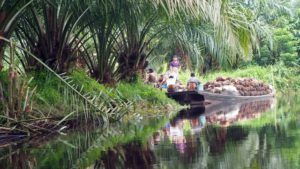 Sri Dewi Titisari, head of the Marine and Fisheries Office of South Sumatra province, pointed out that South Sumatra alone had 17 districts and 2.5 million hectares of canals, rivers, ponds, lakes and marshes scattered throughout them. To assist, the Ministry of Marine Affairs and Fisheries established a Southeast Asian fisheries development center in South Sumatra that is operating pilots of ‘fish forests’ or ‘silvi-fishery’ in canals that are at least 500 meters from a river or coastline so as not to disturb riverine vegetation or mangrove systems. “There are things we must observe,” she cautioned, “such as choosing canals and ponds that are adjacent to communities so that they can manage the fisheries and use the products for household consumption, for food and nutrition security. 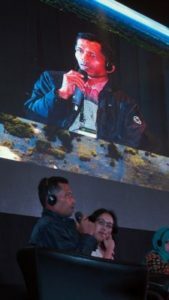 Aulia Perdana, a market specialist with ICRAF, confirmed that rewetting peatland as a critical part of rehabilitating it and maintaining its function as a carbon store did offer market opportunities as mentioned by the previous speakers. Other peatland products, such as rattan, sago and nypa palm (Nypa fruticans), also showed promise for further development, he said. In conclusion, the moderator reiterated that while there were many challenges, from the nature of the peatland itself through to the markets for its products, the panelists had demonstrated that were many opportunities for them to be overcome through continuing and expanding collaboration between farmers, governments and the private sector. By Rob Finlayson, originally published at ICRAF’s Agroforestry World. This work forms part of the CGIAR Research Program on Forests, Trees and Agroforestry (FTA). We thank all donors who support research in development through their contributions to the CGIAR Fund.